When most of us play golf, we just count our strokes. We don’t give too much thought about what the other golfer playing with us is doing on the same hole, other than when it’s finished. In match play’s hole-by-hole competition, however, it’s often a very good idea to know how the other side is playing each shot. What they’re doing might influence your own choices. Some folks think you should not do this, and should just play your own game without even thinking about the other player. I think these folks are a bit more like Spock than us humans. Some more match play moments from the 2016 U.S. Mid-Amateur may help prove the point. In the Round of 32 match held Sept. 13, Philadelphia Amateur winner Michael McDermott of Bryn Mawr, PA faced Joseph Alfieri of Lutz, FL. Lutz played several past USGA events, including Mid-Ams and the Public Links Championship—and at this level, no one is a pushover. On the first hole, a 507-yard par 5, McDermott laid up his second shot. Alfieri showed that he had a good supply of gumption, belting a fairway wood from 262 yards out for a possible eagle putt. Nice idea–except that his ball drifted right and bounced into a pond 50 yards from the hole. The ball lay just underwater, about 8 inches from the shallow shoreline. The rules official walked over, and discussed Alfieri’s options with him. This included playing from the water; dropping the ball two club lengths from the red-lined edge no closer to the hole; or dropping the ball on the other side of the pond on the same line as the ball’s heading when it crossed the hazard, no closer to the hole. Except for whacking the ball out of the pond, all other options added a stroke to his total. Alfieri quickly chose the whacking option. Stepping carefully into the water’s edge, he made a clean swipe, advancing the ball halfway to the hole. Meanwhile, McDermott’s third shot landed in a left greenside bunker, and his blast from there rolled 6 feet past the hole. Alfieri’s chip shot finished 5 feet from the hole, and he made par. McDermott missed his putt. Alfieri went one-up. 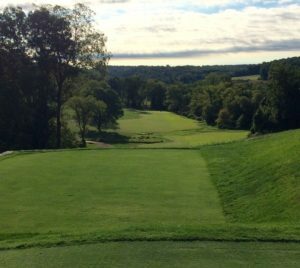 The 6th hole on the Old Course at Stonewall. I don’t think anyone present would have bet money on that result—except maybe Alfieri. Five holes later, it was McDermott’s turn to surprise his opponent. The 435-yard par-4 sixth hole tees off from a hilltop. Golfers then cross a small creek and marshy area as they walk toward the fairway. Alfieri hit a good drive to the center of the fairway, 137 yards out and a few dozen yards past the creek. His second shot landed on the green, 25 feet past the hole. McDermott had trouble with this hole in earlier rounds, and this round was no exception. His drive went right, into the red-staked marshy hazard area just past the creek. After taking his drop, however, McDermott made his third stroke count. It spun to a quick stop 2 feet from the hole. Alfieri then putted to 18 inches for a conceded par, and watched McDermott coolly run in his one-putt par to tie him. McDermott went one-up in the round on the next hole, and the match stayed that way until the 13th, when he went two-up. Alfieri then faced another challenge on the 177-yard par 3 15th, after McDermott’s tee shot finished 8 feet above the hole. The Floridian’s ball had plugged into the face of the front greenside bunker, with only a half-inch or so visible above the surface. The rules official again made sure Alfieri knew his options, including taking an unplayable lie and dropping the ball elsewhere in the bunker, or just hitting and hoping for the best. He hit and hoped—but his ball stayed in the bunker. A missed putt led to Alfieri’s conceded bogey, and he conceded McDermott’s birdie, going 3-down with three holes to go. Even so, the situation seemed to inspire Alfieri and bother McDermott. The Floridian played the 16th in par, while McDermott made a conceded bogey. On the 17th, a long par 3, Alfieri hit the green with his tee shot, but McDermott tugged his 7-iron left and onto the unpaved cart path. After taking relief, he made bogey while Alfieri made par, bringing the match to 1-down with one to go. At that point, whatever nerves had affected McDermott on the past two holes seemed to disappear. His tee shot on the 18th landed in the fairway 140 yards out, and his downhill sand wedge approach stopped 11 feet from the hole. Alfieri continued his valiant effort to tie the match and force extra holes. His drive made the center of the fairway, and his approach shot from 177 yards finished hole-high and 9 feet away. McDermott coolly stepped up and hit his first putt 15 inches past the hole. Alfieri’s birdie try went a foot too far. After conceding Alfieri’s par, McDermott’s own shadow covered his short path to the hole. Unfazed, McDermott made his putt for the 2-up victory. Dwight Gregg of Lewes had a hole in one Jan. 21 at The Rookery’s South Course. Playing the red tees, he used a 7-iron from 102 yards out for an ace on the seventeenth hole. This is his second hole-in-one in the last two years, and he’d gone ace-less before then. Considering Jim Klinedinst’s similar story from the Jan. 20 column, perhaps it’s not just a pleasant coincidence.